Charles Booth's 'Descriptive Map of London Poverty'. 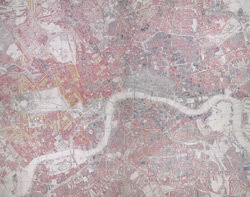 bl.uk > Online Gallery Home	> Online exhibitions	> Crace Collection of Maps of London	> Charles Booth's 'Descriptive Map of London Poverty'. Gold: Upper-middle and Upper classes.Wealthy. Pink: Fairly comfortable. Good ordinary earning. Pale Blue: Poor. 18s. to 21s. a week for moderate family.